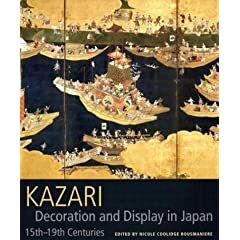 This book is a beautiful, lush photographic catalogue of Japanese decoration from the 15th through to the 19th century. It collects all aspects of decorative items, from paintings to dishware to kimono and shares them in large full-colour photographic plates. The texts are in-depth and interesting without being ponderous or overly academic, and the author makes a concentrated effort to explain terms transliterated from the Japanese. There are essays for each category and further elaboration when these categories overlap. As interesting as the text is though, it is definitely the photographs that make this book worth the value. It is a large, hardcover volume, similar to a coffee-table art book. The photographs are huge, sharp, and full of detail. I have tried to take a few examples, please forgive the flash reflection - it's grey and wintery and awful out today. - Anyone interested in the history of decorative arts in Japan as a whole. - Anyone looking to learn of the evolution of practical and graphic design. - Anyone looking for some lovely Japanese eye candy. - Anyone looking for procedural how-tos for Japanese art. - Anyone interested in books specifically about kimono.